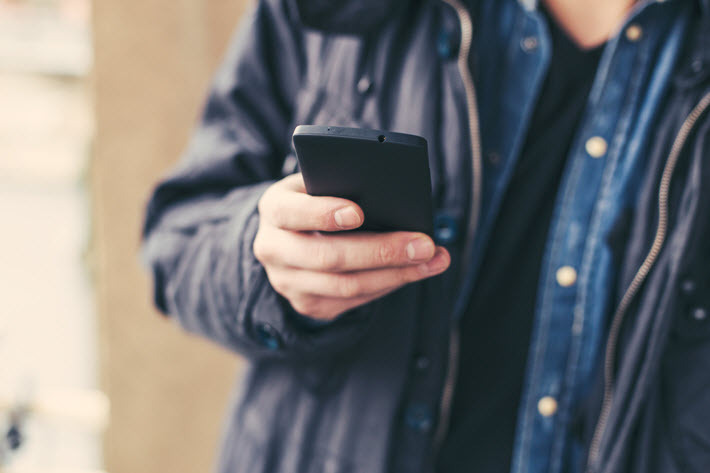 Reading ranks fifth in BookNet Canada’s newest survey of respondents’ leisure activities, and smartphone reading is on the rise. Thirty-eight percent say their reading increased in the last year. 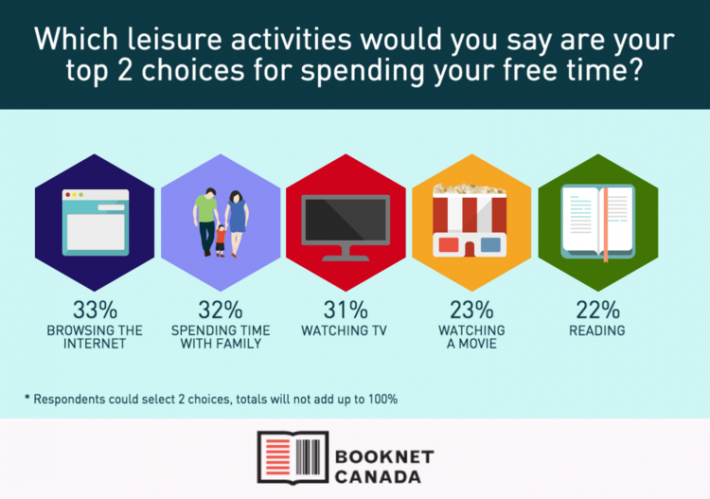 When BookNet Canada looked at the results of this year’s free-time survey, the information coming in from their 750 respondents revealed that reading is their fifth most popular choice for a leisure-time activity. It’s good to note that the 22 percent of answers favoring reading are related to reading books, because the leading choice of the surveyed group was browsing the Internet–which, of course, involves a good bit of reading except in pure-video 0r other visual environments. 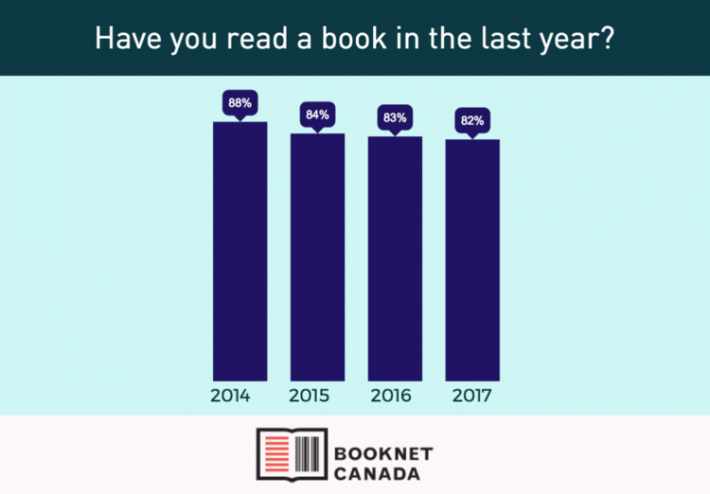 In 2014, 88 percent of the Canadians surveyed told BookNet they’d read a book in the last year. This winter, when surveyed, 82 percent had the same answer. “While the percentage of people who say they have read a book in the past year has been trending down slightly since 2014, the numbers are only barely outside the margin of error,” BookNet’s report reads. And how about the amount of reading Canadians surveyed say they’ve been doing in the last year? Here, the response is more upbeat. While 44 percent said books they’d read (or listened to) had stayed the same in the previous 12 months, 38 percent of those asked have told BookNet that their reading increased in the last year. In a follow-up assessment of survey data, BookNet looks at several aspects of Canadians’ reading habits. 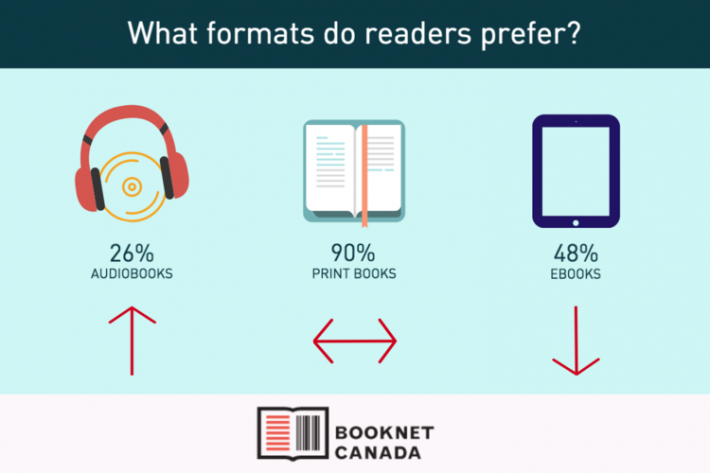 Of particular interest here is input on format and device preferences and on how Canadians say they’re discovering their books. In terms of format, audiobooks continue to show strength in the Canadian consumer market as they do in the US and UK markets. 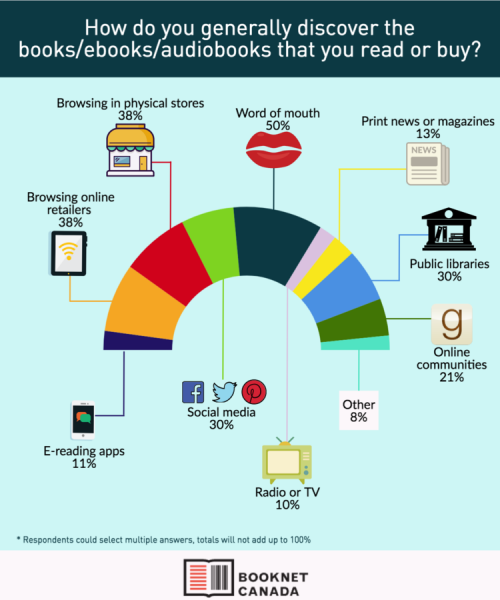 “There are more readers between the ages of 18 and 44 who listened to an audiobook last year,” write the report’s authors, “than those who read a print book or those who read an ebook. What might be partly “the Wattpad effect” shows up when BookNet looks at device preferences for digital reading. As many in publishing know, 90 percent of Toronto-based Wattpad’s 55 million monthly users are engaging with the platform on mobile devices. It would be interesting to know how much the popularity of Wattpad in its native Canada might have on smartphone usage for reading. What will catch the attention of marketers is the even split on discoverability registered by BookNet in its survey between online and brick-and-mortar stores. Thirty-eight percent of discovery, respondents tell the organization, goes to browsing in physical stores, while exactly the same portion, 38 percent, of discovery is accomplished in browsing online–perhaps the result of all that leisure time spent in online browsing. More research and analysis information from BookNet Canada is here.